Save big off the MSRP on ASG’s SS-3000 SS Series 4-mm, 4.8-27.2 ozf/in Shock-Absorbing Electric Driver w/Lever Start (MFG Part Number: 64285) when you use our FPF051614 Coupon Code. This Featured Product Friday (FPF) promo is valid from today, May 16, 2014 through Sunday, May 18, 2014. 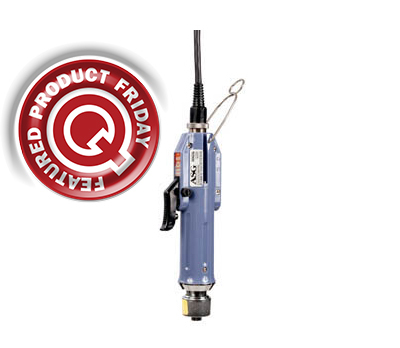 The ASG 64285 SS-3000 SS Series Shock-Absorbing Electric Driver (Q Source SKU: A019-000548) is perfect for sensitive applications and rework jobs involving hard drives, LCDs, high-density boards, and more. The SS-3000 provides 80% less impact and uses #10 or smaller screws. Regularly listed at $862.38, but with our FPF code savings you’ll get it for just $765.00 (a savings of $97.38). While this is a 3-day limited-time price, the coupon is unlimited. Use the code as many times as you like while it is valid—and please feel free to share the code with your friends & colleagues, too. Please note: This promo is valid only at QSource.com.